Well, it was a couple of days ago, since it I am behind a couple of days on the blog posts, but the sentiment is there. I hope you all had a great day. Kate and I woke to our Christmas present being the fact we were in Amsterdam. Not a bad one hey? The question was though what would we do on Christmas day? If we were at home nothing would be open and we would probably just have to settle for finding somewhere we could have a couple of good meals. But here in Amsterdam, I would almost go as far as to say it was business as usual. The vast majority of things were open, outside of the odd museum and restaurant. So we had options! After a slow start we decided to visit a couple more of the museums we had in mind. So off we went to Museumplein, just a couple of minutes walk away. Seemed like a lot of people had the same idea as it was buzzing. 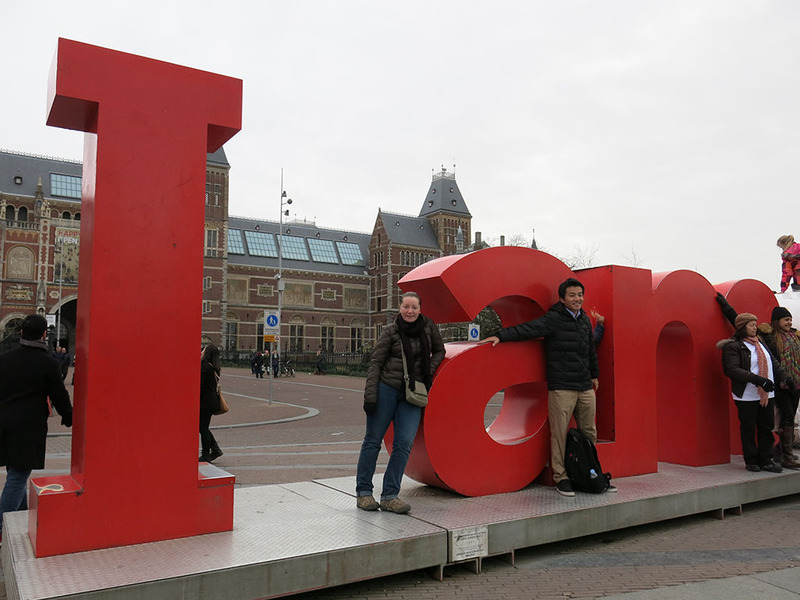 The “I AMsterdam” sign was chock full of people clambering over the top of it. Cute slogan, and they seem to be doing their marketing well here. Outside of the Rijksmuseum, the other big one to visit is probably the Van Gogh Museum. Dedicated to a more modern master, this houses an extensive collection of his work. Sunflowers? Check. Starry Night? Check. A lot of the big ones were here as well as a myriad self-portraits (as was Van Gogh’s thing). Seemed like a lot of other people had this idea as the museum was pretty busy, certainly the busiest we had seen anything. So we drifted along with the crowds. Photos weren’t allowed in most of the museum, so again there will be a lack of pics in this part of the story. I did take one before I realised however, one of this small painting that I really dig a lot. “Skull of a Skeleton with Burning Cigarette” is an early work and not typical of the rest of his oeuvre. But something about it is fascinating. Those of you who are avid readers may recognise it from the cover of a David Sedaris book too! 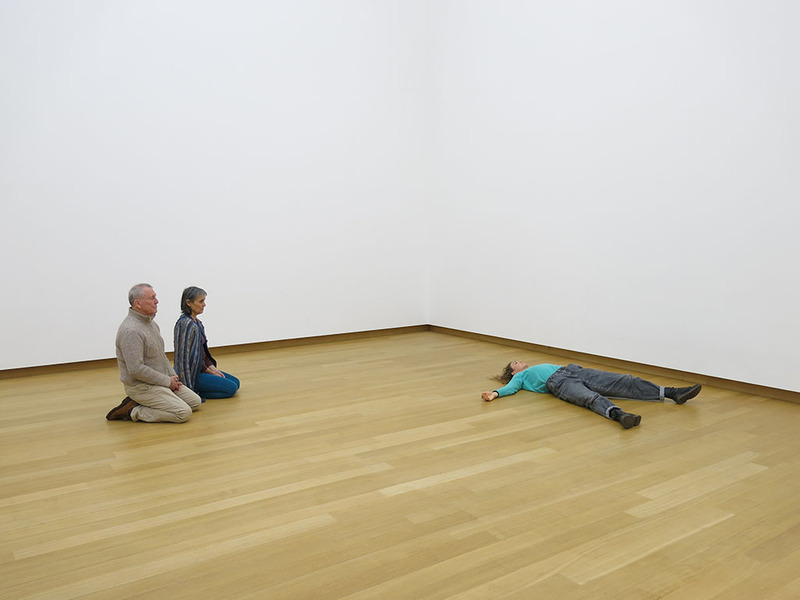 The museum charts his work in a fairly chronological manner, telling his story of mental breakdown along the way. It is a sad tale (like many artists unfortunately) and really it is thanks to his brother’s wife that Van Gogh achieved the posthumous fame he did. Some of the major works of Vincent’s appeared to be missing from the walls of the main collection, and that was because they had been moved into one of the temporary exhibition spaces in the museum. Why? Luckily for me, there was a temporary exhibition in its last weeks of Munch / Van Gogh! Score! Munch is a favourite of mine and I have been fortunate to visit the Munch Museum in Oslo, as well as see visiting exhibitions in Melbourne and Helsinki. This was another chance to see his works in the flesh. The exhibition was designed to draw parallels to the two artists which, when looking side by side, become quite clear. Many of the Munch paintings I had seen before, either in Oslo or in Melbourne. But it is a thrill to be greeted again by a pastel Scream, a Vampire, a Madonna, and the Dance of Life. We wandered through, and given we have museum passes, I see me popping in a agin before our time is up here in Amsterdam. Kate was up for a break, but I was still in museum mode, so I wandered into the Stedelijk Museum, otherwise known as the modern art and design museum. These kinds of museums are not really Kate’s thing, so I took the opportunity to pay it a visit. Like every other modern art museum I have written about, it was a love/hate thing. I love to see some of the work of the more modern masters… Van Gogh was again present, but also the other Dutch modern figurehead, Piet Mondrian. While everyone can pick a Mondrian from a mile away (those lines and colours are a little bit of a giveaway), it is great to see a piece of an artists work that is totally not what you expect. 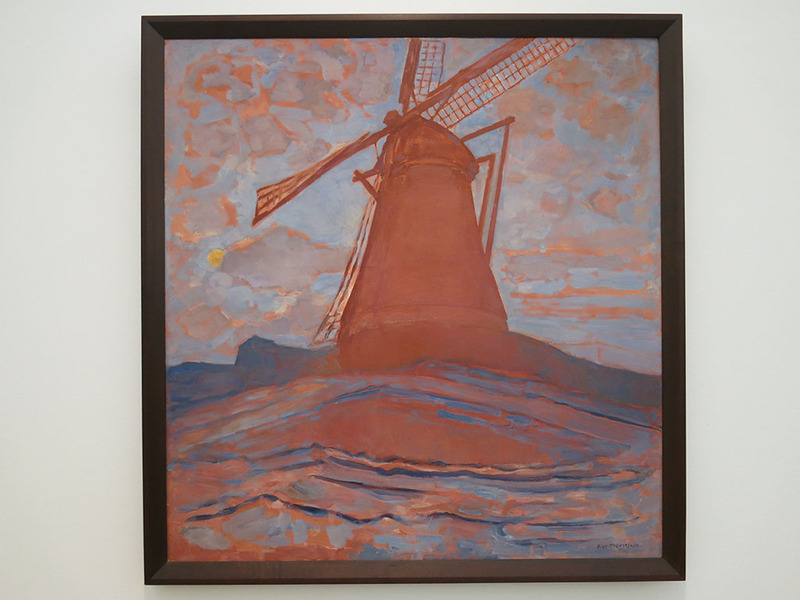 The windmill above was also by Mondrian and is a good example to show when people wonder if some modern artists can actually paint. One painting that jumped out was this one by Anna Boch. The name didn’t really jump out at me, and I can’t recall having seen much of her work in other places. But this was just gorgeous. I will have to read up on my fringe impressionists by the look of it. The rest of the gallery was the usual mix of great modern works (I LOVE this Man Ray photo, above), and many head scratching moments. The main head scratching was when I entered two large, empty rooms. In the first, I wandered through when an old man started walking along side me, chanting in Dutch (I assume). As I kept walking, smiling at him, and when I got to the exit, he said what sounded like a title and date, as if that was the name of the piece, and then wandered off to the next unsuspecting people. Hhhmmm! The next room was also large and empty, except for three people. Two were on their knees facing toward a younger girl who was VERY slowly moving about. A small crowd was transfixed by what was going on. I can’t claim to understand. On the wall was actually a card indicating a title and the date acquired. Was this the piece? I was confused (not a bad thing when visiting these places). Amsterdam is known for a lot of things, some high brow, and some not so much. 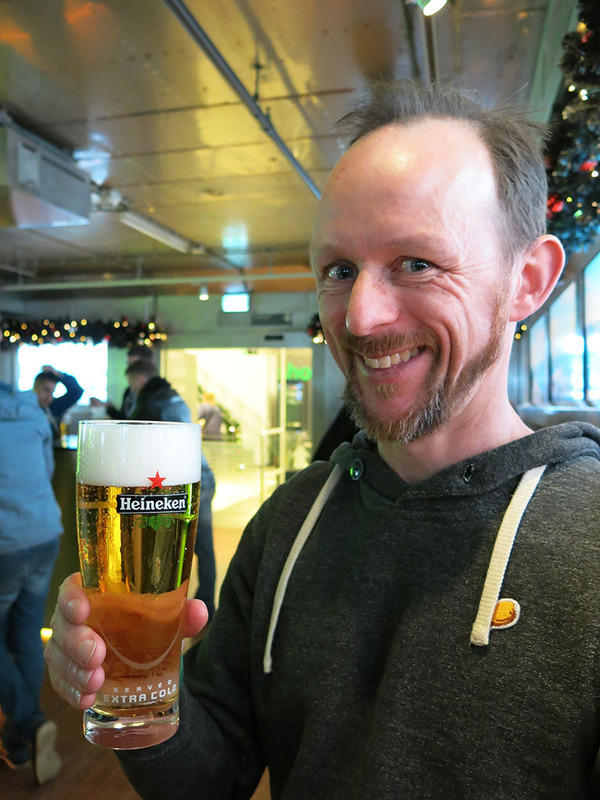 It was time to indulge in some of the lower-brow with a trip to the Heineken Experience! Ha! 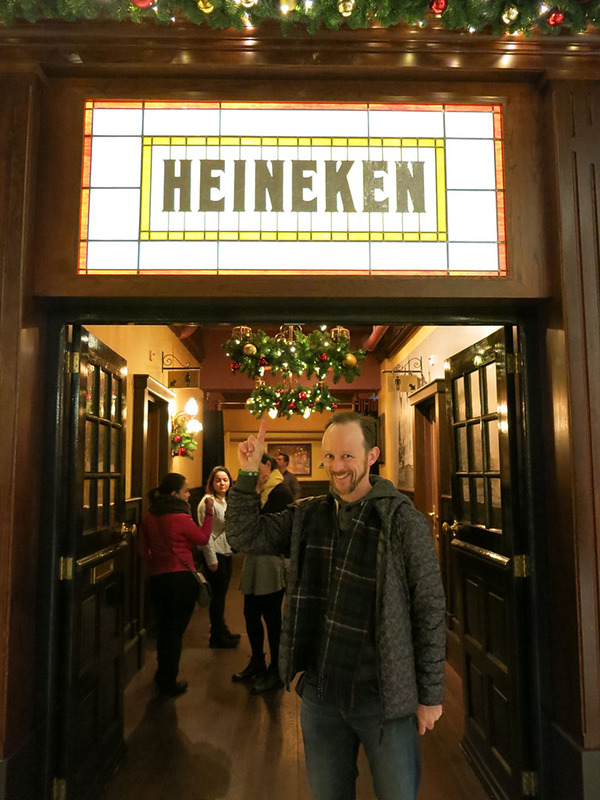 I had visited 15 years ago and remembered a kitschy trip through the Heineken history with the promise of beers at the end. 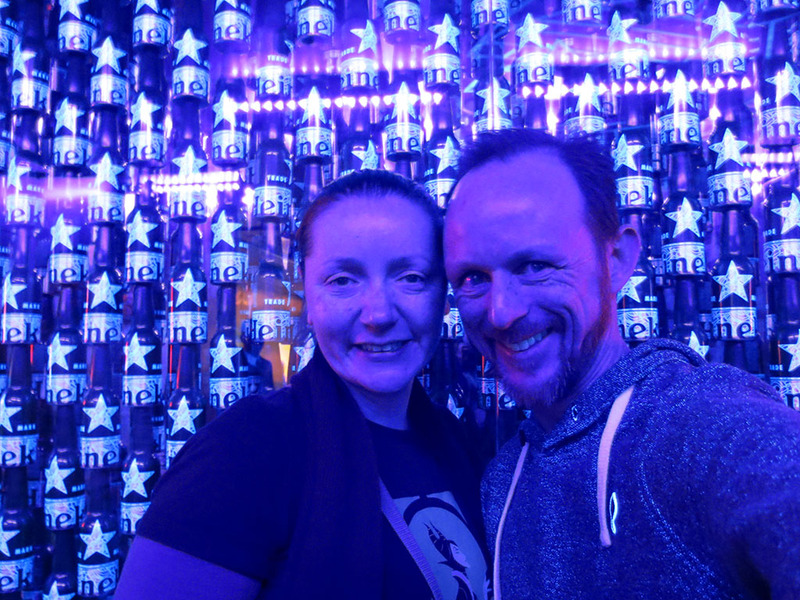 While some of the exhibits had changed a bit, it was still what I remembered… a kitschy but kinda fun way to get people to not simply race to the end to start drinking. As such we wandered through the exhibit, stopping at every cheesy photo stop we could. Sure we learned about the company and the beer making process, but it was the cheesiness of it that made it fun. If you want serious, there is Museumplein. But we were up for a giggle and this was alright. We reached a football zone where we could indulge in Heinekens sponsorship of the Champions League tournament with lots of goofball photos. Why not we said! Along the way there were some other activities. Have you ever wanted to feel like you’re a beer? Of course you have! So why not jump on their pretty lame beer ride! That is being a bit harsh, as it is not really a ride, rather a little bit of an experience of being bumped around, a little wet, and shaken up. Everyone giggled. The other was to try out your expertise at the perfect pour. Kate was not too bad, I was a little better, but neither of us could perfect it. I’m happy to leave it to the professionals. With that we reached the end of the tour. Two beers awaited us each at the end, meaning by the time Kate got a soft drink I had an extra one. I opted to try out their “extra cold” too, which in the end was a colder, slightly less flavoursome, version of their normal beer. But tasty regardless. Job done. 8pm, a few beers under my belt, and we had to find some dinner. Rather than wander aimlessly trying to find something that had space, we visited the Hard Rock that was just across from our hotel. You can always count on them to deliver a tasty burger and this was the case again, with my strange seasonal burger (with goats cheese and apple amongst other things) being pretty delicious. We some celebratory Magical Mystery Mojitos under our belt as well, it was a Merry Christmas all round.